​Our Multi-Bag Filter systems (EMBF) consists of several individual filter bags (2-32) housed in a single vessel. These filters handle high flow-rates (400-4800 gpm) while occupying minimal floor space. Safna's strainer/filter housings are manufactured in many sizes and configurations, and serve as basket strainers or bag filters. In all cases, covers are easily removed while baskets or bags are easily cleaned or replaced. The standard pressure rating for all models is 150 PSI. All housings can be supplied with an ASME code stamp, if required. ​Safna Engineering’s filtration strainer/filter housings are manufactured in many sizes and configurations, and serve as basket strainers or bag filters. In all cases, covers are easily removed without any special tools. Bags or baskets are replaced or cleaned. 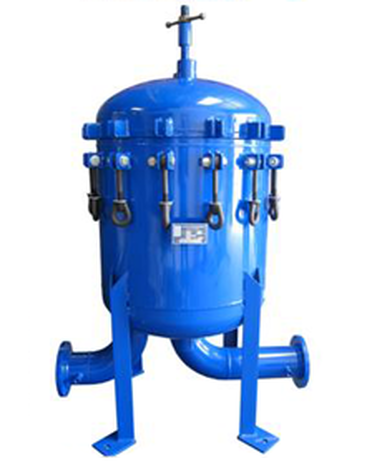 Model EMBF Multi-Bag Filter Housings are offered in two standard sizes with a variety of pipe connection styles and sizes. Flanged connections are also available. All units will be designed, manufactured, tested, and stamped (upon request) in accordance with the ASME BPV Code, Sect. VIII Div. I using the latest edition and addenda. Call or email our main office in Arcadia, California, to order quality bag filters of every variety.